I actually started making these blocks in March of last year. I had made a 4 inch paper pieced version of this block for the PMQG medallion and then blew the pattern up to 6 1/2 inches to play with. There is a link on my original post to the free paper piecing pattern in two sizes (4 and 6 inch) in you are interested. So this week I made a pile more blocks and this morning finally got them all wrangled into a top. 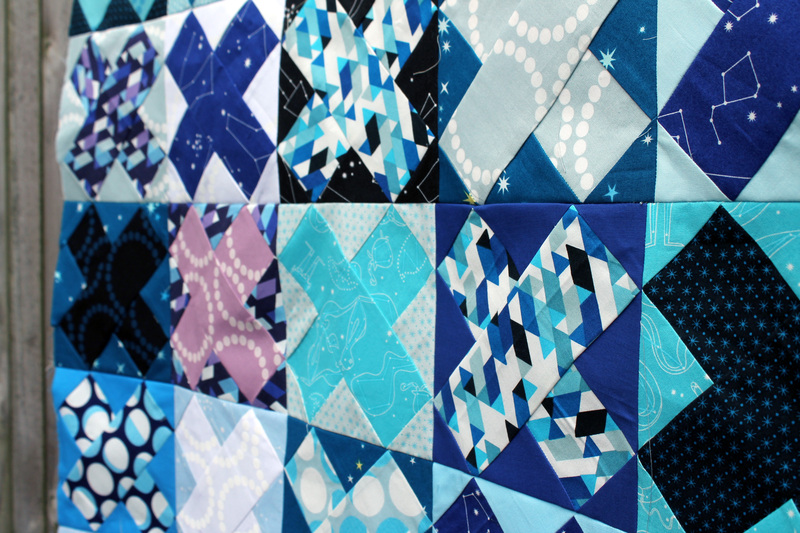 The quilt uses the wonderful Constellation range by designer Lizzy House. I love the fun bright fabrics that Lizzy makes and though I was late to discovering her fabrics, I have been hoarding and using them for a couple of years. I do not think there is a quilt I have made in the last year or so that has not had Pearl Bracelets in it somewhere. 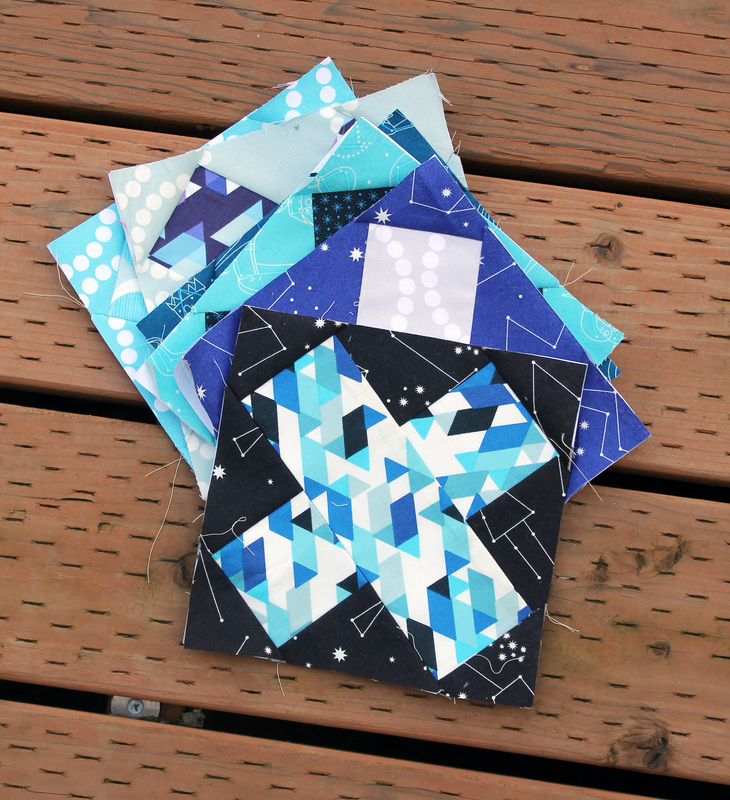 This range is all about stars and fun Constellations, but you could easily use this pattern in any fabric range…the trick is to make sure you have a nice contrast in your blocks and that you embrace the light and dark fabrics from the range. To really up the contrast with this top I also pulled in some solid white fabric as well as the white on white Pearl Bracelets. I also did not shy away from adding a touch of red/purple. One of the fabrics in the line had a touch of this colour and I thought I would embrace it…just a little. I used the design rule of three and added three blocks with the purple. I just love how the quilt seems to sparkle and your eyes are forced to move around the top. Now all that is left for me to do is remove the paper and quilt this sucker up! 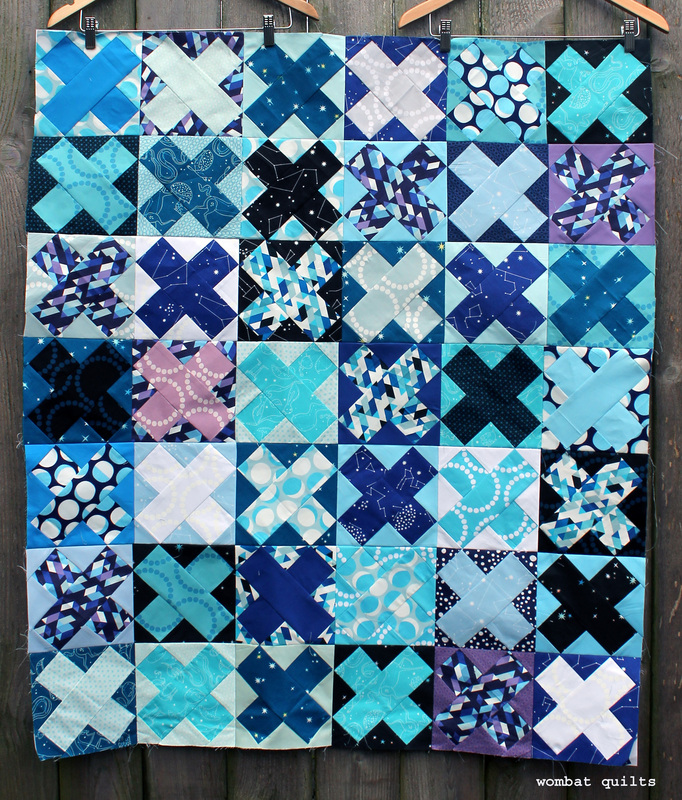 I am linking up today to Crazy Mom Quilts Friday Finishes. « Better late than never…. Oh this is really nice!!!! You nailed the light and dark contrast and arrangement! And the few purple additions were a perfect touch. (March of las year is SO OLD. I followed that with VBG–guess that I inadvertently got some HTML and it disappeared. A really stunning quilt and the purple additions just add that finishing touch. It would never have occurred to me. Perhaps on another post you could explain the design rule of three. It clearly works! I will try and talk more about it is in the future but if you are interested in learning more now there is a great post here http://www.ceciliawalkerdesign.com/2011/01/21/rule-of-three-and-odd-numbers/ on the rule of three in design. Um, when I went to download and save your 6″ block, I could not find a link or pattern for the 4″ block. Could you please point me in the right direction(for the 4″ block)? Hi. The four inch block is embedded in the original post. Just click the PMQG Medallion Border paper piecing pattern, which should be in red or highlighted. Any problems let me know and I can email you the PDF. Great use of color and block placement to make this top shine! I love this so much- the pops of purple/red work really well. I’ve never heard of the quilter’s rule of three. Good to know! 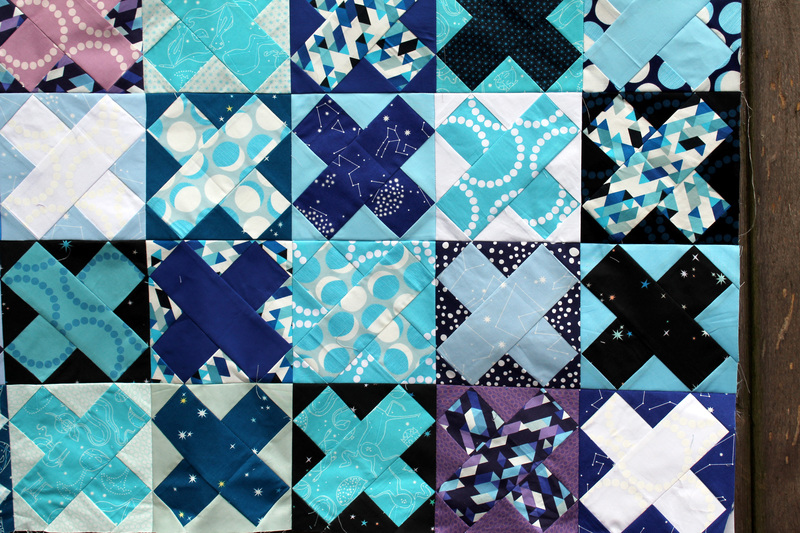 And gorgeous quilt! If you are interested there is a great post here http://www.ceciliawalkerdesign.com/2011/01/21/rule-of-three-and-odd-numbers/ on using threes in design. Oh, the joy of finishing elderly WIPs and achieving something everyone Ooohs and Aaahs at. And we are, because it’s beautiful. Nice work! oh this is pretty cool! Very nice. 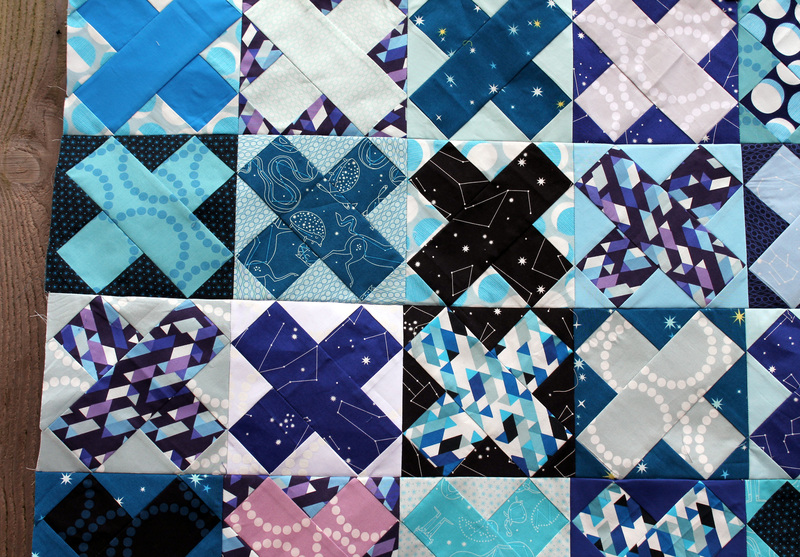 This quilt will sparkle! You leave the paper in until the blocks are sewn together? 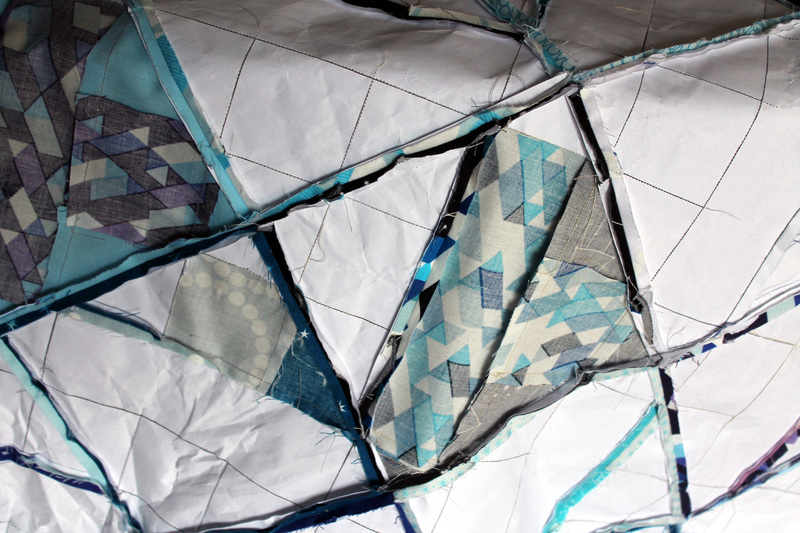 I always remove it one step before – as I finish each block. Love this, especially the two purple solid background blocks!! Loving this quilt! Your choice of colors calls to me. I too dedicated the first few months to finishing WIPs and cleaning up my scraps. It feels great! Very nice, I love the design and all of the colors you used. 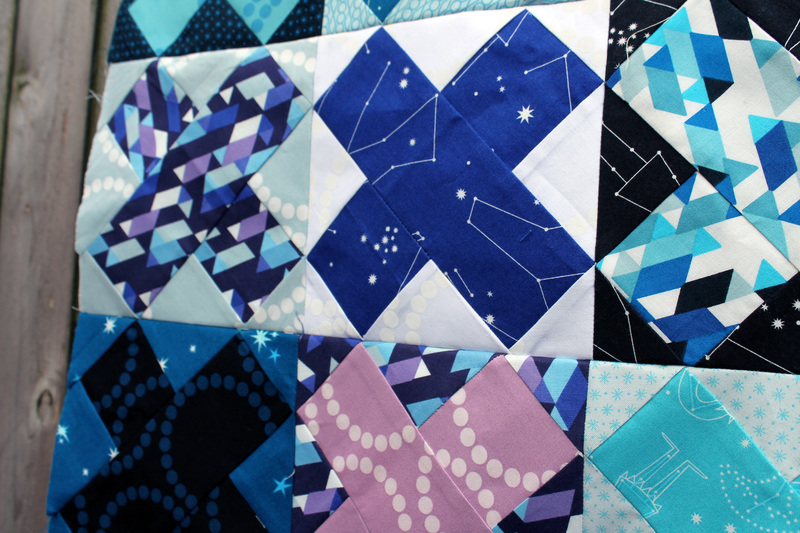 Wonderful quilt and I love that constellation fabric. A beautiful study in value, and that in itself makes the eye move around the quilt, much like your eyes would move around the night sky. Marvellous, I say, marvellous! May I suggest a daring white (or white on white) for the binding?! I just adore this quilt. Great pattern and perfect fabrics!! Allison as a scrap quilter by nature I tend to use all my little bits, and I unfortunately was not smart enough to buy yardage of this range!